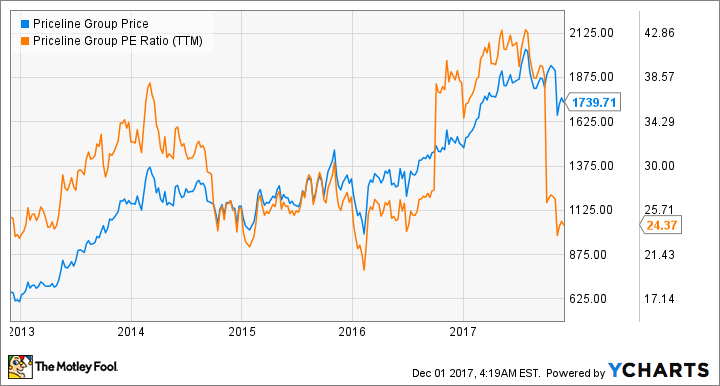 Is it Time to Get Greedy With Priceline Group Stock? This leading online travel agency could be a solid growth play over the next few quarters. Priceline (NASDAQ:BKNG) rallied nearly 20% this year, easily outpacing its rival Expedia's (NASDAQ:EXPE) 8% gain. However, Priceline remains down nearly 10% over the past month after its fourth quarter profit guidance missed analyst expectations. I think that sell-off was an overreaction, and that the dip could mark a good buying opportunity for four simple reasons. Priceline and Expedia control over 90% of the US OTA (online travel agency) market with their massive ecosystems of travel booking sites. Priceline's ecosystem includes its namesake site, Booking.com, Agoda.com, KAYAK, Rentalcars.com and OpenTable. Expedia's network includes its namesake site, Orbitz, Hotels.com, Trivago, HomeAway, Travelocity, CarRentals.com, and various other sites. Both companies have been expanding their overseas operations to offset the slower growth of the US market. That duopoly is so strong that late OTA challengers either struggle to compete or simply get bought out. Amazon (NASDAQ:AMZN), for example, tried to disrupt the OTA industry with a hotel booking platform called Destinations in 2015 -- but it shut down the site just six months after its initial launch. Priceline's revenue rose 20% annually to $4.43 billion last quarter, marking its second straight quarter of accelerating sales growth. That growth was driven by an 18% jump in gross travel bookings (16% on a constant currency basis), which exceeded its prior guidance for 11%-16% growth. Room nights rose 18.6% during the quarter, and rental car days climbed 5.5%. That growth offset an 11.8% decline in airline ticket bookings. Its revenue is expected to rise just 15% during the current quarter, due to a tough comparison with record high room bookings a year earlier -- but analysts see its growth accelerating again to 16% for the first quarter. 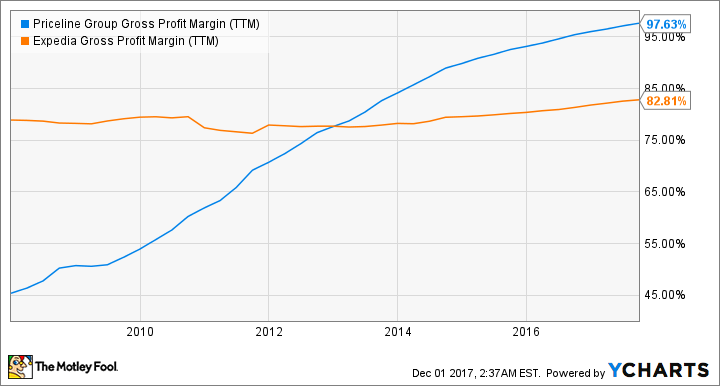 One of Priceline's biggest advantages over Expedia is its gross margin growth. Over the past decade, Priceline's inorganic growth strategy greatly reduced its cost of revenues (down 41% annually last quarter) and enabled it to retain nearly all of its revenues as gross profits. Priceline's gross profit rose 22% annually to $4.37 billion last quarter. $4 billion of that total came from its overseas operations, which posted 20% annual growth on a constant currency basis. The rest came from its US operations, which reported 11% growth. 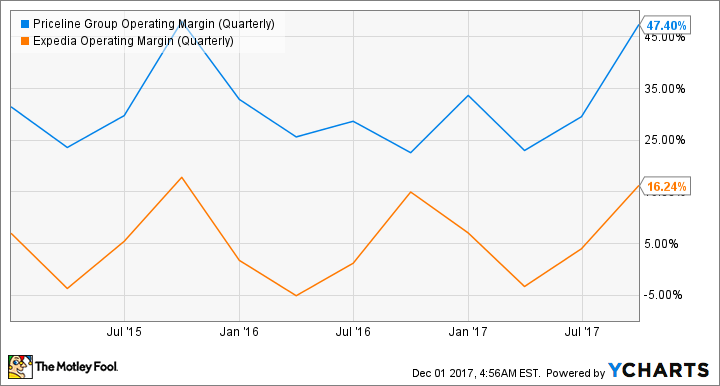 Priceline's operating margin growth is also far more impressive than Expedia's. It reduced its operating expenses by 18% annually last quarter, which boosted its quarterly operating margin from 22.6% to 47.4%. During the quarter, Priceline's adjusted EBITDA rose 18% to $2.2 billion, which topped analyst expectations by $50 million, and its non-GAAP net income rose 19% to $35.22 per share -- which also beat expectations by $0.97. The only soft spot in Priceline's report was its bottom line guidance for the current quarter. Analysts expected Priceline's adjusted EBITDA and EPS to respectively grow 15% and 10%, but the company's guidance called for almost flat EBITDA growth and a 1% to 6% earnings decline. Priceline attributes that softness to the aforementioned tough comparisons to room bookings in the prior year quarter, as well as the higher impact of marketing expenses and currency impacts. That outlook was disappointing, but analysts still expect Priceline's earnings to grow 17% this year and 15% next year. Priceline's P/E is also much lower than Expedia's P/E of 48. Looking ahead, Priceline trades at just 21 times forward earnings, compared to Expedia's forward P/E of 24. So is it time to get greedy with Priceline? Priceline is a volatile stock and is vulnerable to unpredictable headwinds like terrorist attacks or natural disasters, but I think that it's a good value at these prices. Its bottom line will hit a speed bump this quarter, but its top and bottom line growth should accelerate again throughout 2018. Therefore, I believe that it might be a good time to start a position in Priceline. But investors shouldn't get too greedy and start a full position -- they should average into this stock over the next few quarters.